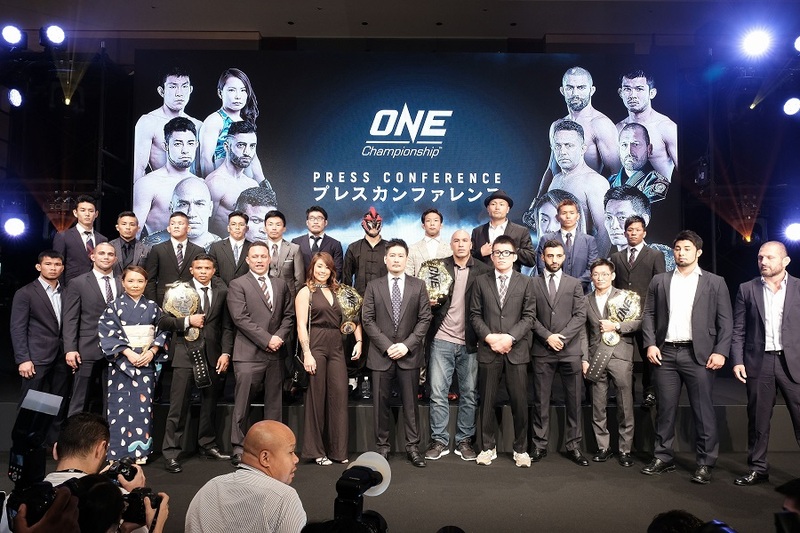 ONE Championship™ (ONE), just held a Press Conference announcing the promotion’s first live event in Tokyo, Japan, scheduled for 31 March 2019. Media from all across the globe gathered to participate in the Press Conference, which was led by Chairman and CEO of ONE Championship, Chatri Sityodtong. The esteemed martial arts superstars took to the podium to deliver their thoughts in support of ONE Championship’s first live event in Japan, and what is in store for martial arts in Asia in the immediate future. Japan has a rich martial arts culture and history, and ONE Championship has been planning for a very long time to bring our authentic martial arts experience right here to the fans, deep in the heart of Asia. Our mission at ONE Championship is sacred, we want to unleash martial arts superheroes unto the world -- world-class athletes who ignite passion and hope, and who help weave martial arts into the very fabric of human life. By sharing their stories with the world, ONE Championship aims to change the lives of many through the beauty of sport and discipline. It is our absolute pleasure to announce today that we will be officially holding our first ever live event in Tokyo next March. The ONE Championship superstars here today are some of the greatest talents in the world, bar none. They came out here to show their support for ONE Championship, and are living proof of the greatness of martial arts and the impact it has on our lives. Together, we can inspire the world to walk in the true values of martial arts -- integrity, humility, honor, respect, courage, discipline, and compassion. We look forward to seeing you all once again, right here in March 2019. A separate summary of quotes from athletes who attended today’s event will be sent following the Press Conference. Sityodtong also took the time out to reveal the ONE Championship 2019 calendar of events, which will see the promotion return to its strong roots in Singapore, the Philippines, Malaysia, Indonesia, Myanmar, China, and Thailand. Two events in Tokyo are scheduled for the year, taking place in March and October, while new markets Vietnam and South Korea are also introduced. ONE Championship is having a phenomenal 2018 thus far, and with eight more blockbuster live events left to close the year, there is a lot of world-class martial arts action to look forward to. The next two events, ONE: BEYOND THE HORIZON set for 8 September in Shanghai, China, and ONE: CONQUEST OF HEROES set for 22 September in Jakarta, Indonesia already feature some of the most compelling martial arts contests of the year that fans can certainly look forward to. In addition, world championship boxing makes its ONE Championship debut when The Ring and WBC Super Flyweight World Champion Srisaket Sor Rungvisai of Thailand defends his title against Iran “MagnifiKO” Diaz of Mexico in the main event of ONE: KINGDOM OF HEROES set for 6 October at the Impact Arena in Bangkok.